There are suddenly a lot of Red FXX everywhere, which previously a rare item to be seen. 7-11 has just replenished their stores with Hot Wheels 2008 models. Together with this restock, a lot of Red FXX are distributed everywhere in Malaysia. Besides, there are also Exotics Enzo and Nissan Z Top Secret in the list. 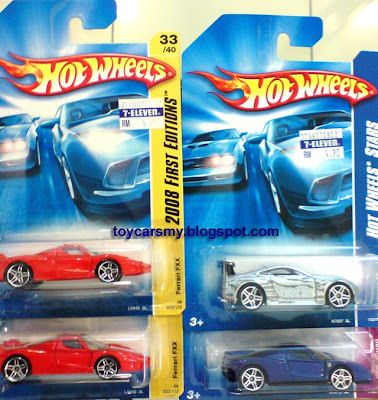 A new wave of Hot Wheels has been released in Vietnam 2 days ago also. what do you have there? Share out for swapping. Cheers. Just got the white VW Golf GTI and 03 bikes to complete my Custom Bikes Team. Real Durian Runtuh now. Hope that Mattel keep it up. Looks like my complaint bout their lousy marketing on this site is seen by someone at Mattel. Hope that more good cars will come!